Brown Marmorated Stink Bug (BMSB): BMSB presence is spotty and still much higher than it was earlier in the summer. Now that apples (and pears) are the only fruit present for BMSB to feed on, growers must have a program to address this pressure. Growers need to protect the fruit with short PHI insecticides at this time of year, especially with increased activity. BMSB effective materials that have a 7 day or less PHI include Baythroid (Apple, Pear and Peach), and Belay (Apple, Pear only). Dinotefuran – Venom and Scorpion, can be used under section 18 labels for the high rates effective for BMSB. These labels state a 3 day PHI for both pome fruit and stone fruit. Both products are toxic to bees and should be used when there are no flowering weeds in the orchard to attract bees. The Venom rate is 4-6.75 oz/A, and the Scorpion rate is 8-12 oz/A (both have a 2 application maximum). Make sure to apply thorough coverage, make frequent applications, and rotate chemistries as much as possible. Sharpnosed Leafhopper (SNLH): Treatments for the second generation are usually timed to be close to the second adult flight peak. 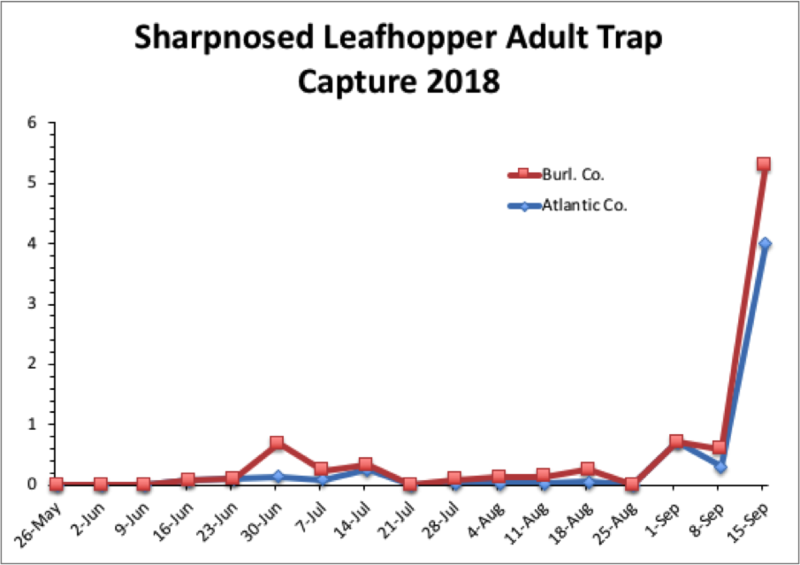 While SNLH populations have been pretty low this year, we finally saw an increase in adult activity this past week with adult trap captures taking a significant jump. Adults are the stage that can fly and are therefore more motile and effective at spreading blueberry stunt disease. Given the facts that is now past the middle of September, and adults are moving, growers should apply a treatment targeting sharpnosed leafhopper as soon as possible. If you have been saving your diazinon all year for this purpose then you can use it now. This will also help control any scale crawlers which are still active. If targeting only SNLH then any of the neonicotinoids work well – Assail, Actara, Admire. Imidan will also work well for SNLH control. Some of the pyrethroids – Asana, Brigade/Bifenture, Hero, can also be effective, but generally don’t give as much control as the previously mentioned products. Putnam Scale: If you had scale infestation this past season and still have not put on a treatment, there is still time to do so. We still had crawler activity over this past week. If you had scale marks on your fruit, then you can be assured that there are quite a few scale insects on your canes. If left untreated (or unpruned), these can lead to cane decline and more heavily infested fruit next year. Esteem is the product of choice for this insect, but it MUST be used as DILUTE as possible to achieve full coverage of the wood. Pyrethroids can also give some control, but only if used in a dilute application.